Around the corner from Absinthe restaurant in Hayes Valley is the latest retail concept from the founders of Azalea: Welcome Stranger. While Azalea has a strong emphasis on denim, stocking over 100 different jeans styles and current fashion trends for men and women, Welcome Stranger is all about timeless looks for men. Owners Catherine Chow and Corina Nurimba opened Welcome Stranger in September 2010 after successfully opening and operating Azalea since 2003. Treasures like old-timey glass libation bottles, well-loved leather-bound books, tobacco pipes, antlers, and other curios add character and complement the men’s clothing and accessories sold here. Brands and pieces are discriminatingly chosen in keeping with traits of tradition, utility, and modern elegance. Though Welcome Stranger’s wares range in price from economical (Zig-Zag shoes, $20/pair) to extravagant (Surface To Air Duffle Coat, $729), it’s not a place for the bargain hunter but rather for men (and women shopping for them) that are willing to spend for and lasting quality. It’s also a destination for limited-edition collections and some things that are just not available anywhere else. Welcome Stranger is one of two locations in the world (the other being Paris) where you can walk in and try on a pair of Naked & Famous Denim’s Double Weave Cotton-Wool Houndstooth Denim ($322), made of wool and cotton with a houndstooth lining. Only approximately 150 pairs were produced. The checkered denim duffel bag also by Naked & Famous ($240) is another Welcome Stranger exclusive. Naked & Famous is known for their selvedge denim produced in Canada from Japanese denim. 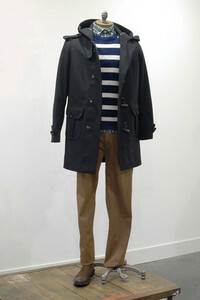 Brands include Rag & Bone, Tellason and SPURR. No need to worry about sifting through pricey denim that’s already been industrially “distressed” or denim with tacky whiskering. Other things you’d have a hard time finding anywhere else within city limits: selections from the Burkman Bros. collection and Six Scents artisan perfumes. Some of the Burkman Bros. selections currently in stock include a brown fair isle crewneck sweater ($165), poplin, and flannel plaid button downs and a hoodie bearing an on-trend tribal print. Every year, Six Scents presents a collection of six perfumes created by collaborations between six artists, each paired with a perfumer, to raise awareness and funding for a charity. Proceeds from the current Series Three ($149 each) go to War Child International, a charity that helps and educates children whose lives have been affected by war and conflict. In addition to a carefully chosen subset of Series Three, Welcome Stranger also stocks a few scents from last year’s Series Two, proceeds of which go to Pro-Natura, an organization focused on sustainable development to improve life in poor and marginalized countries. Swedish outdoorswear brand Fjällräven is also utilitarian, yet classically stylish clothing, with bags constructed of its trademark G-1000 windproof fabric originally used for tents. In contrast with the brightly colored Kanken daypacks decorating Welcome Stranger’s foyer, the store’s selection of Fjällräven (Swedish for “arctic fox”) clothing tends toward the muted colors of the outdoors. Adding a small or large block of the brand’s Greenland Wax is suggested to waterproof and further fortify your Fjällräven purchases. You’ll find plenty of smart pieces from American sportswear company Gant’s Rugger line, including some you might be able to find elsewhere only at the sole G Rugger store in New York. Longing for a Vince or Pauls Smith sweater or the Surface to Air merino wool V-neck with elbow patches ($224), or that one pair of Swedish brand Fifth Avenue Shoe Repair shoes ($560), but cringing at the price tag? Take a turn at the dartboard; if you hit the bull’s eye you get 20% off your purchase! Bottom line: Everything you’ll find at Welcome Stranger is somewhat of an investment piece, but you can count on it to weather the seasons and last for years. Moreover, the honest and attentive one-on-one customer service offered here is about helping shoppers find something that truly looks good and flatters, rather than pressuring into purchasing. Prepare to splurge and fall in love. 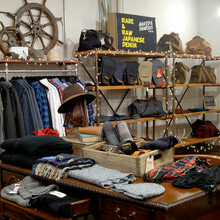 Also stay tuned for events in 2011: a Burkman Bros. pop-up shop and craft day with Fjällräven are in the works.